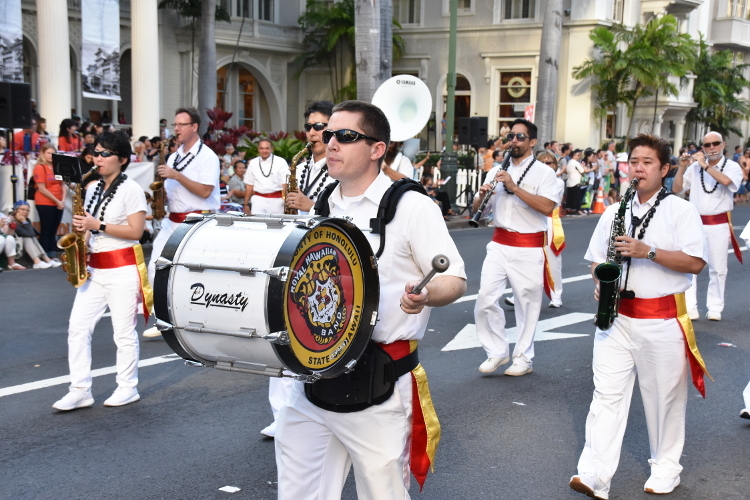 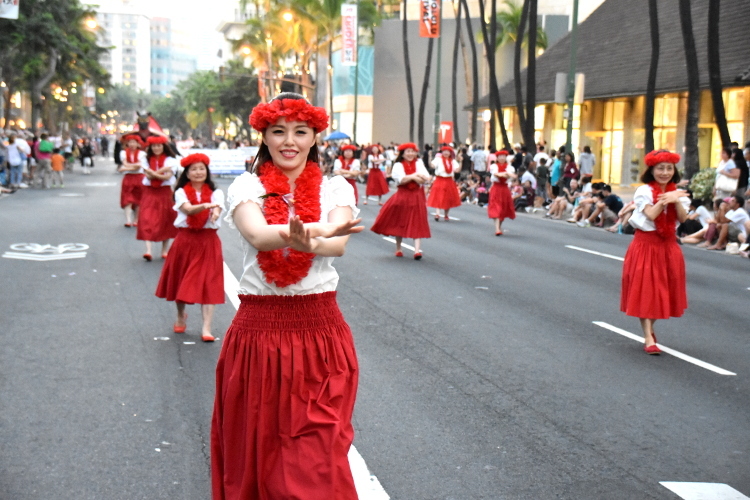 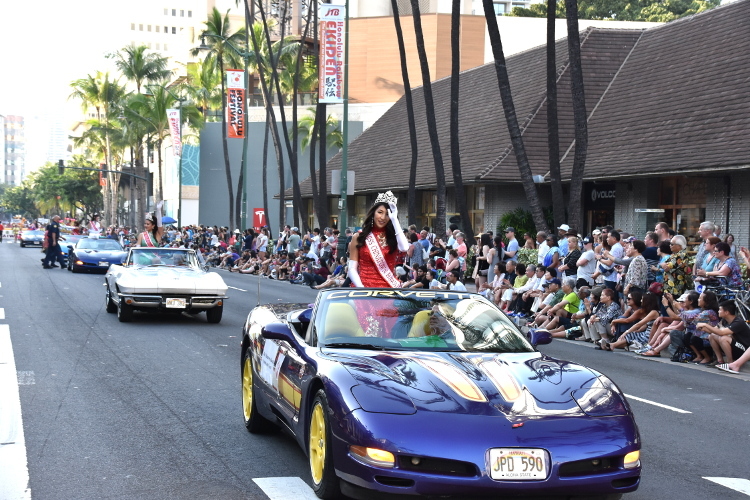 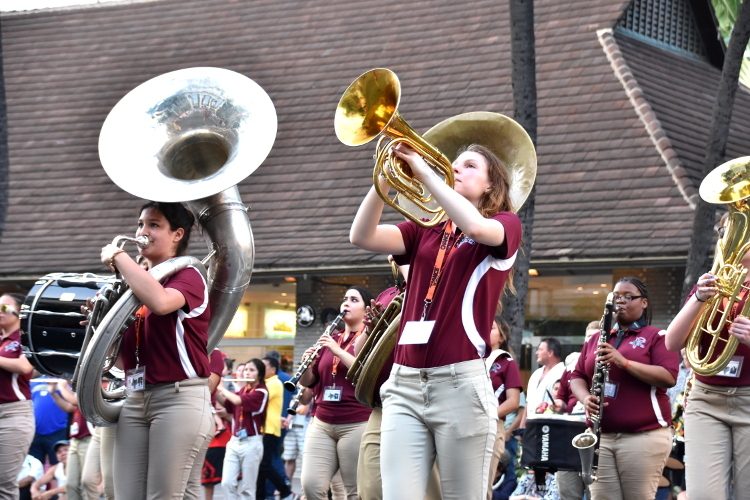 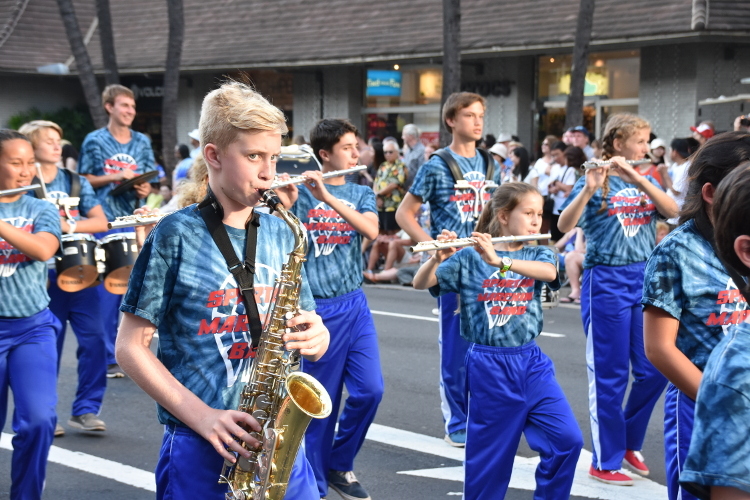 The Grand Parade was held in the warm weather during the evening on Sunday, March 12, which is the final day of the 23rd Annual Honolulu Festival. This is a parade that is being held on Kalakaua Avenue in Waikiki every year. 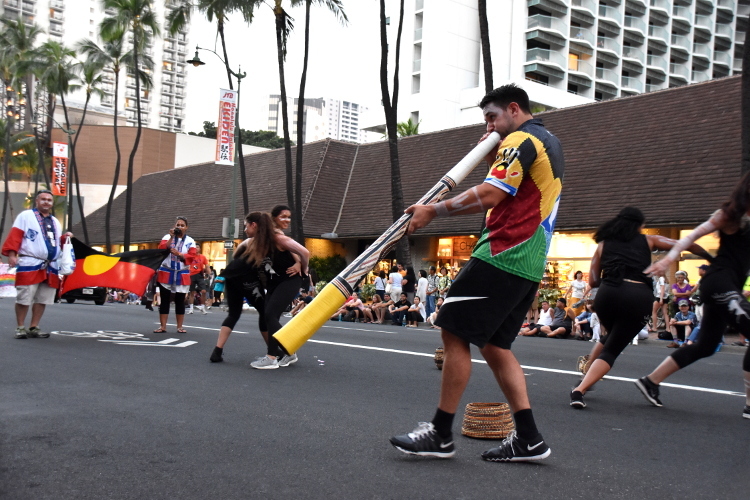 The performers will be performing from Saratoga Road and heading to the east, where the Honolulu Zoo is located. 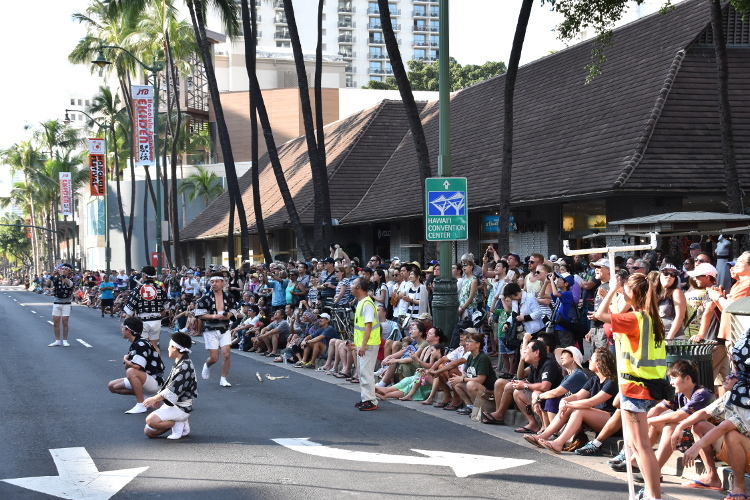 Many spectators regardless of race gather by the roadside to see the dignified performers who presented their own talent and unique culture in 3 days for the last time. 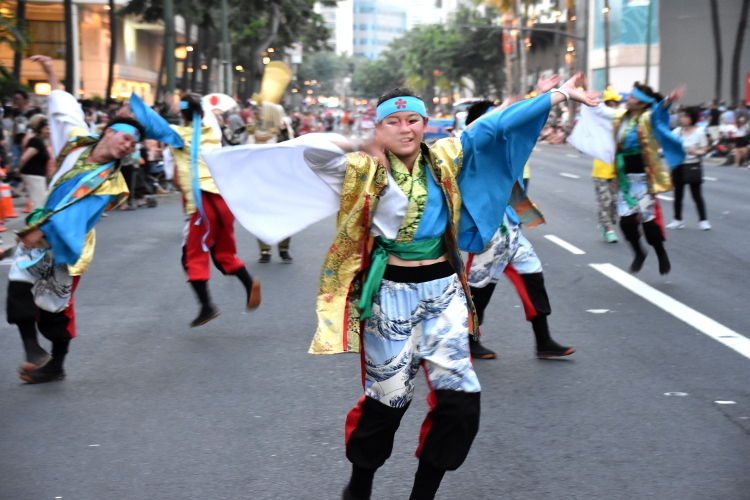 Those performers gave joy and inspiration which the audience discovered new findings of various cultures. 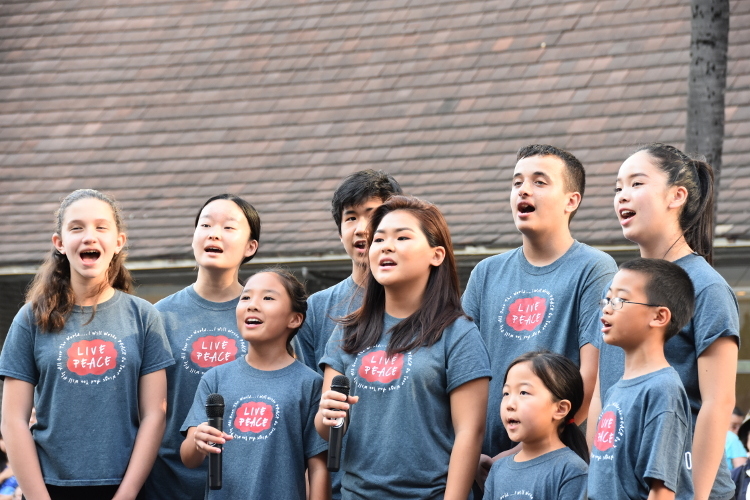 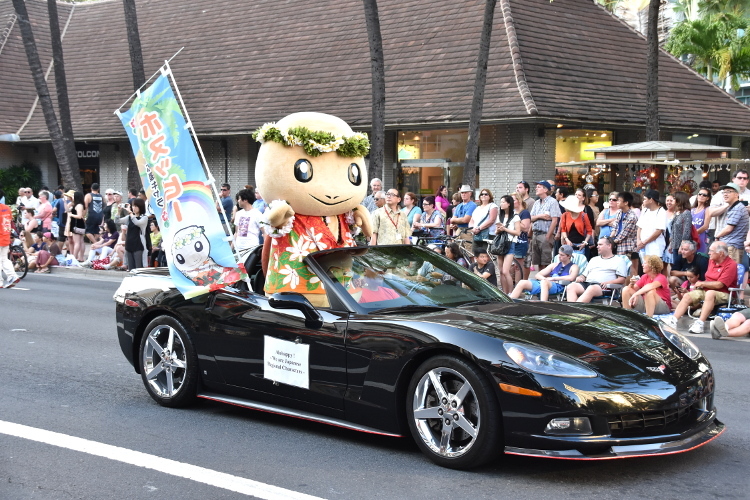 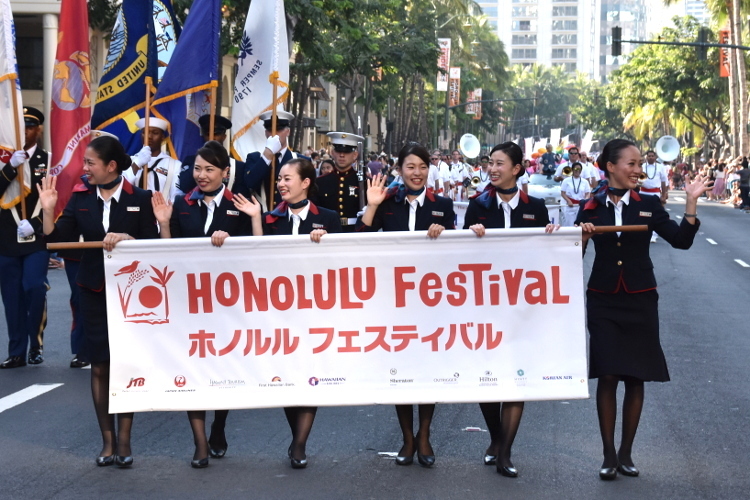 Over many years, the Honolulu Festival Foundation continued to serve as a mediator of a sister city between Nagaoka City and the city of Honolulu. 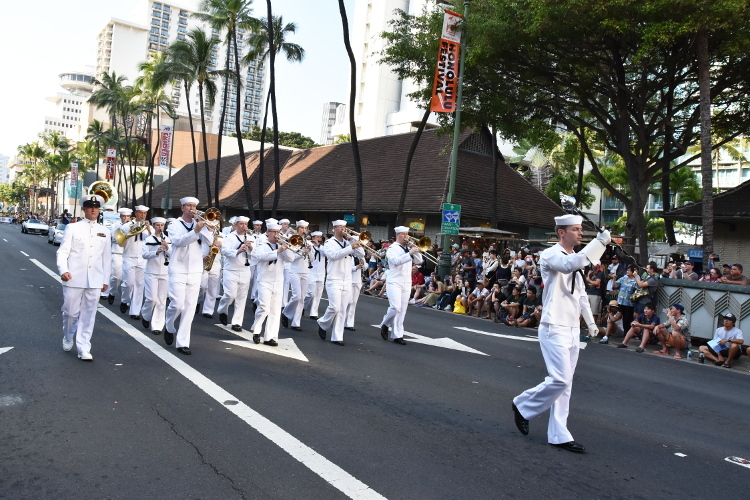 Also, there was a special event to mark the 70th anniversary of the end of World War II at Pearl Harbor on August of 2015 which was successful. 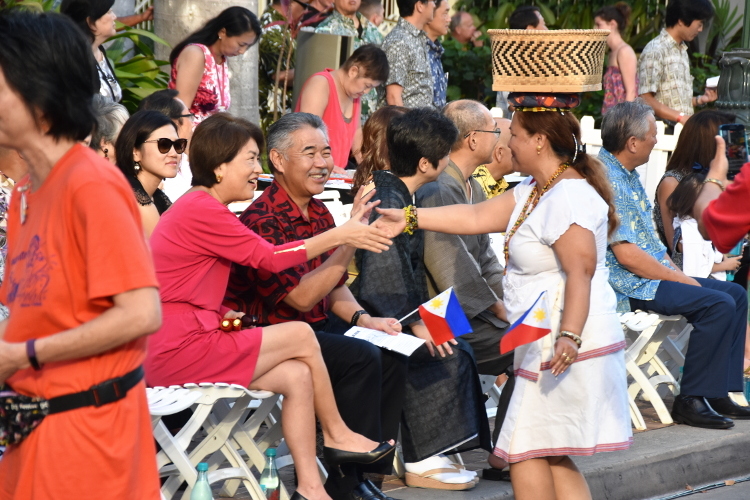 Also, the Mayor and the Vice Mayor of Honolulu visited Japan and established a good relationship with Nagaoka City. 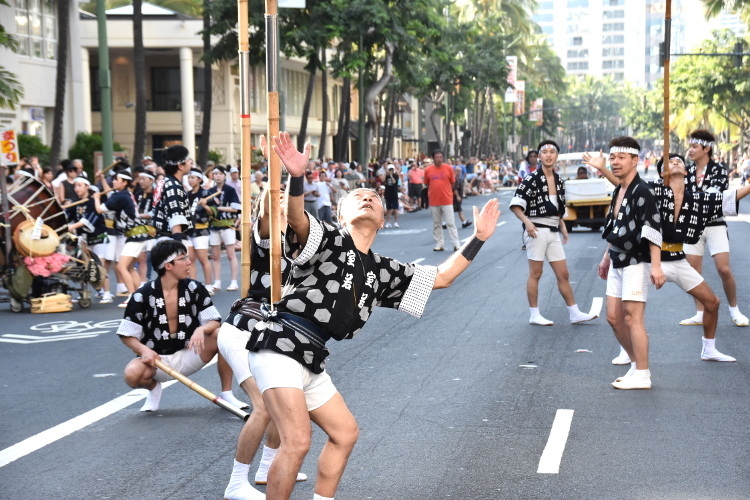 Furthermore, the Honolulu Festival’s Grand Parade has received the Legacy Award from the city of Honolulu on October 22, 2015. 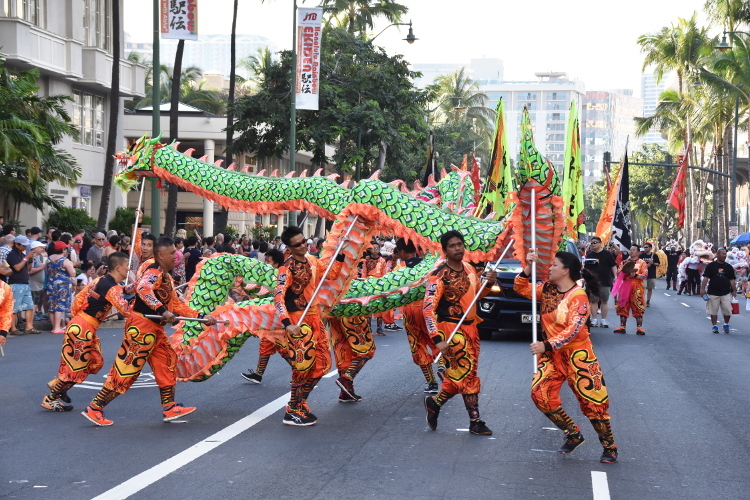 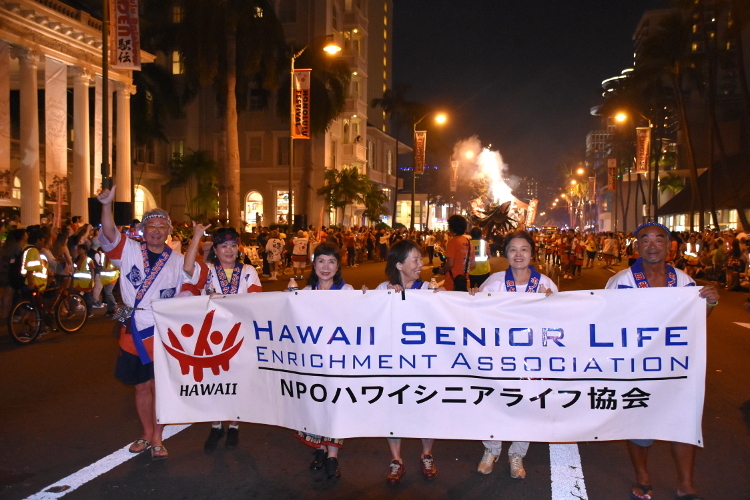 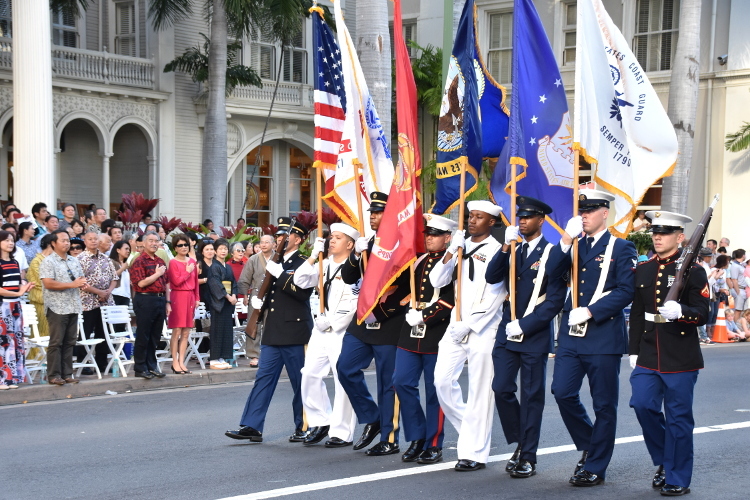 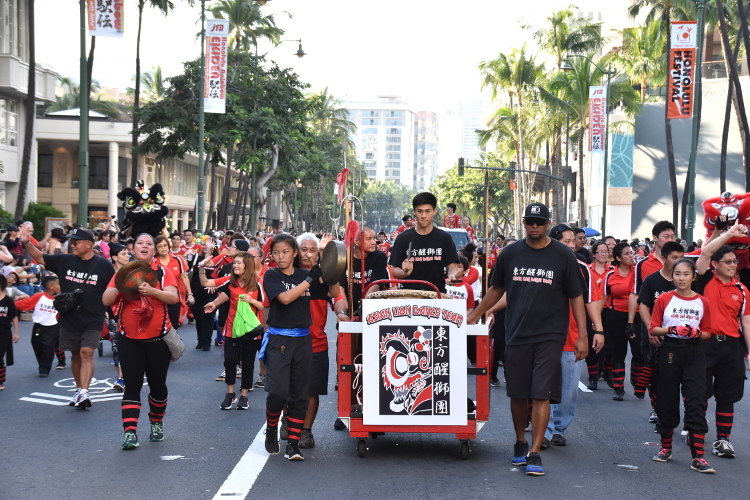 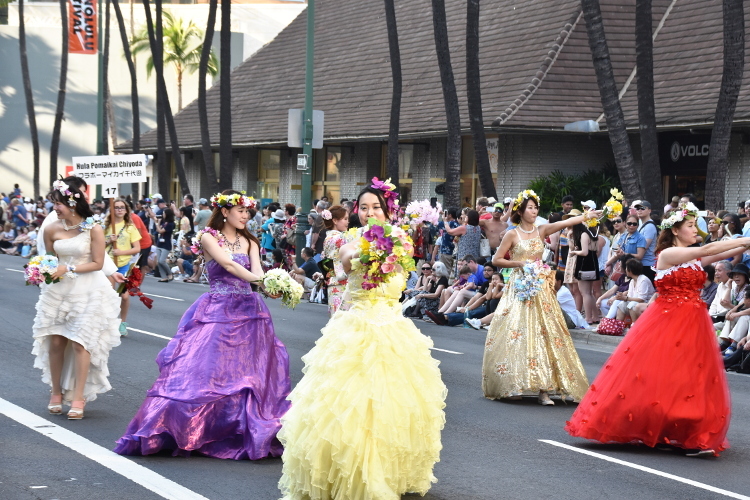 As a result, our Grand Parade was recognized as an annual event of Honolulu, which does not require a special request for approval from the city. 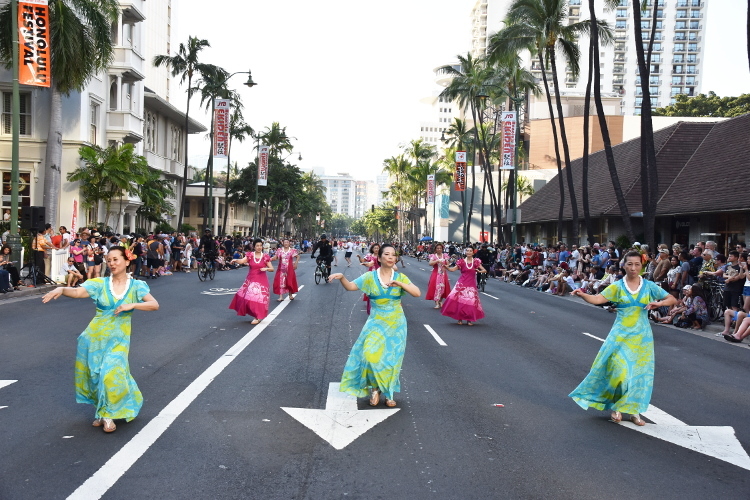 We would like to give a great appreciation to the city of Honolulu for understanding and supporting the Honolulu Festival. 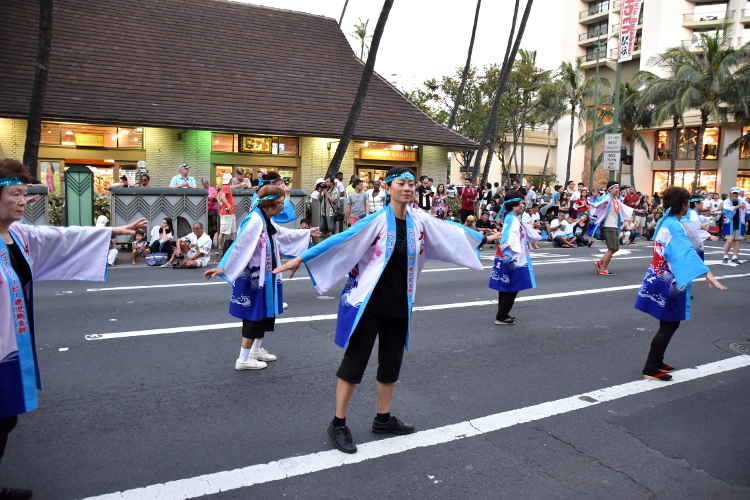 The opening performance was held at 4 locations, where the mic stands were set up. 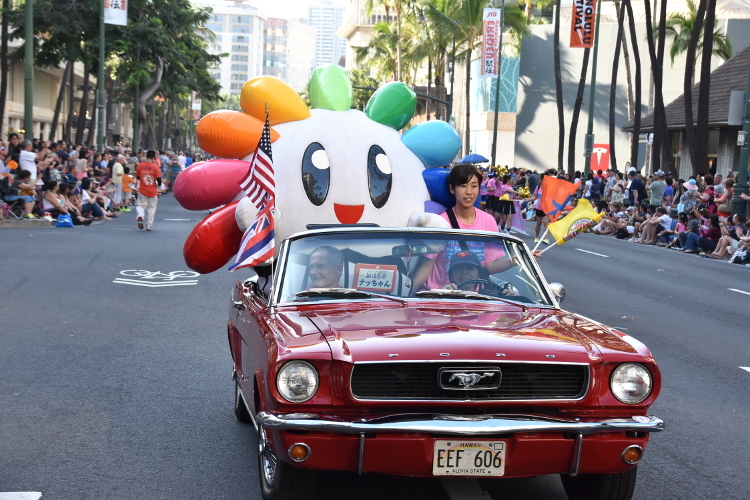 *Click on thumbnails to view enlarged image. 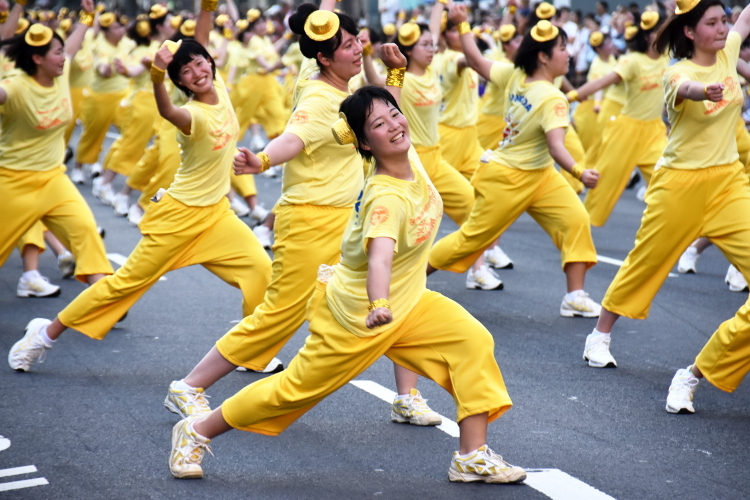 Studio Dance Alive excited the spectators by their uplifting dance. 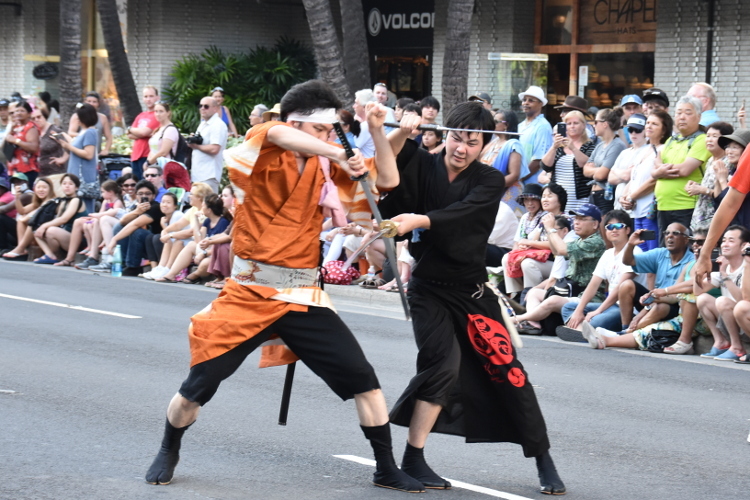 Outstanding performance by the Akita Kanto Festival. 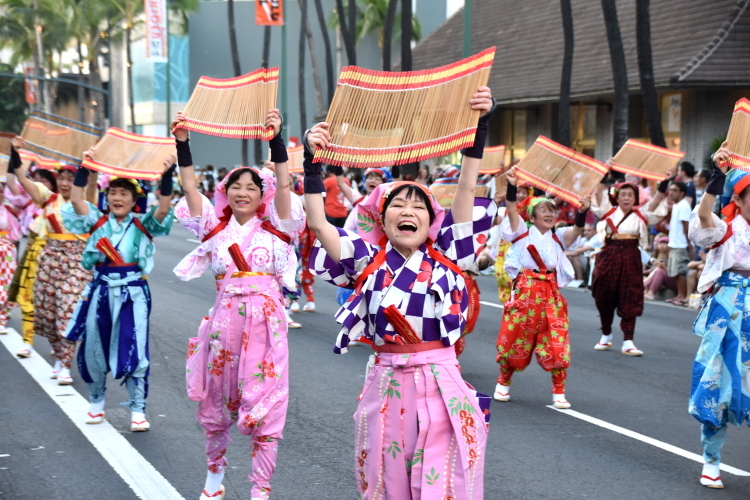 The members of the Akita Kanto Festival showed their great skills by holding Kanto (a bamboo pole with lanterns) only with their flat hand, forehead, shoulder or lower back. 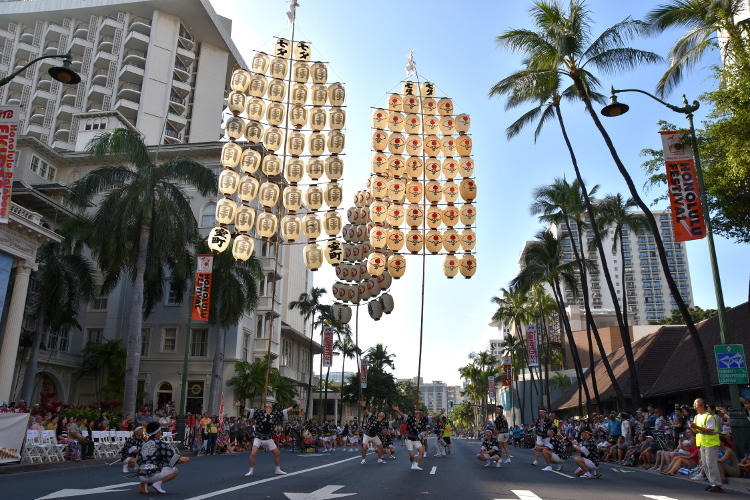 The spectators were looking up as Kanto was raised high up toward the sky. 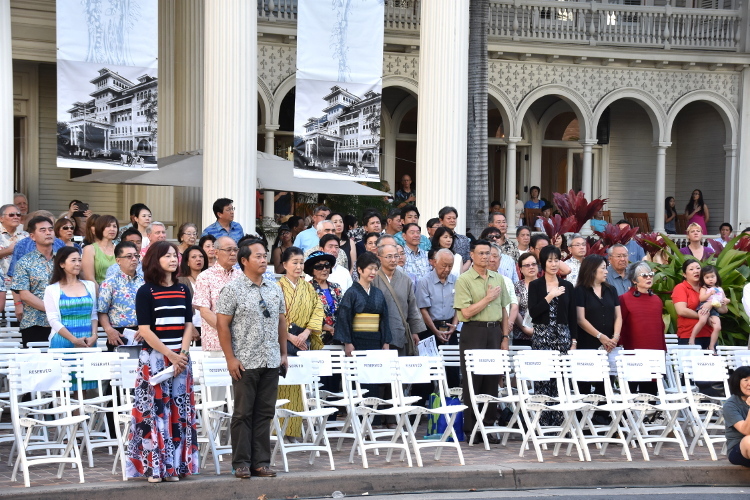 During the national anthem, the VIPs stood up to show respect and gave their attentions . 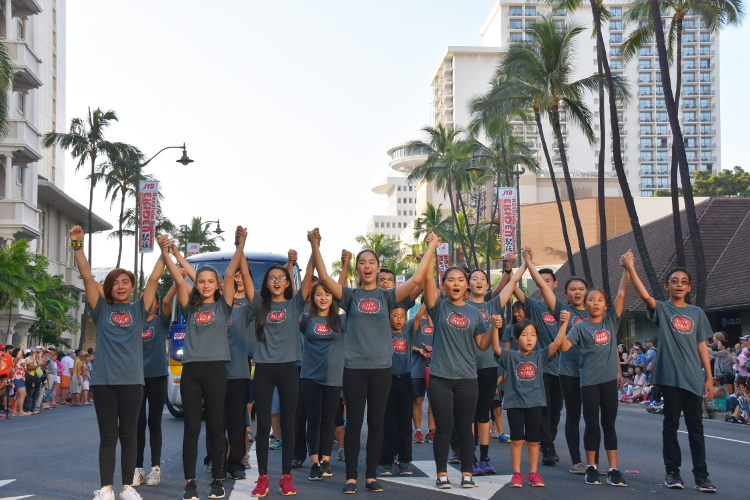 The national anthem was performed by Ohana Arts. 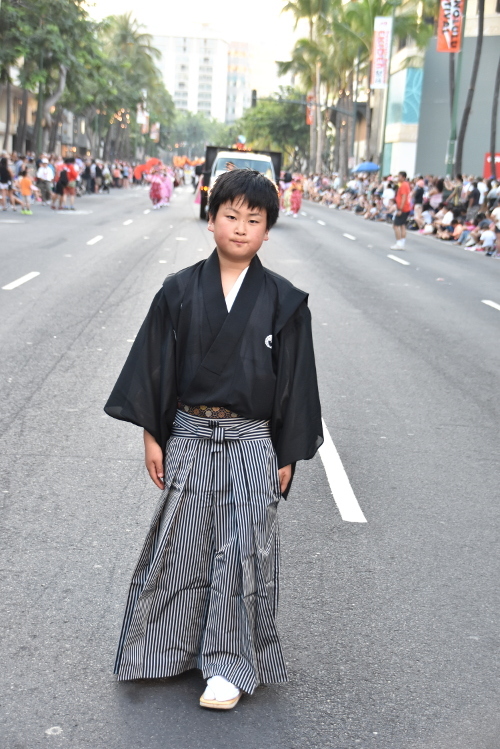 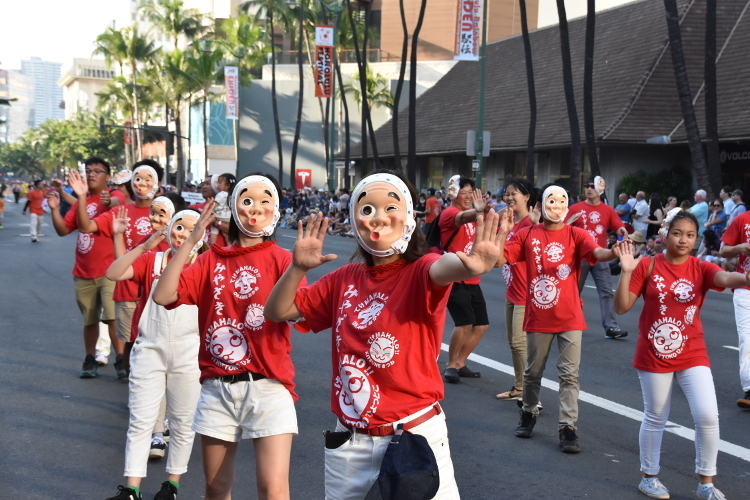 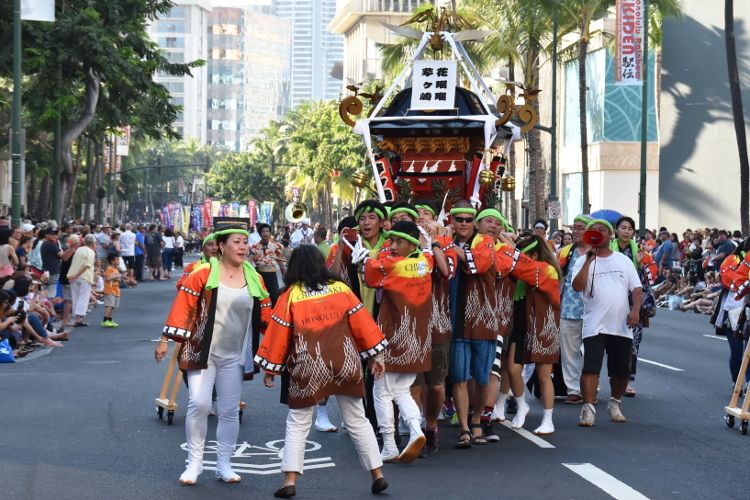 The Grand Parade finally began at 4:30 p.m.
Japan Airlines (JAL) cabin attendants held the banner of the Honolulu Festival while they paraded the streets with smiles. 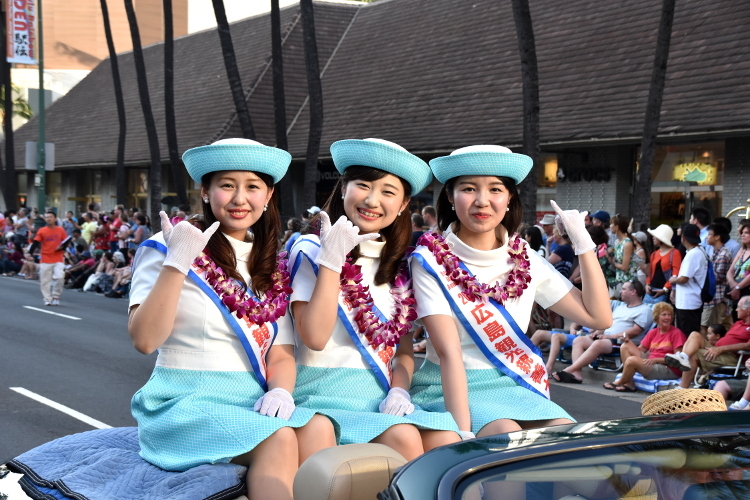 Aloha from the Mayor of Nagaoka City! 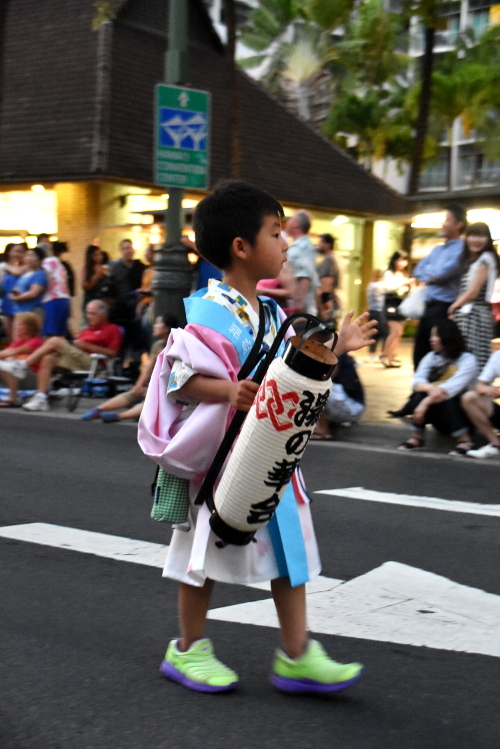 Nagaoka City’s mascot, Nacchan, a fairy of the Nagaoka Fireworks. 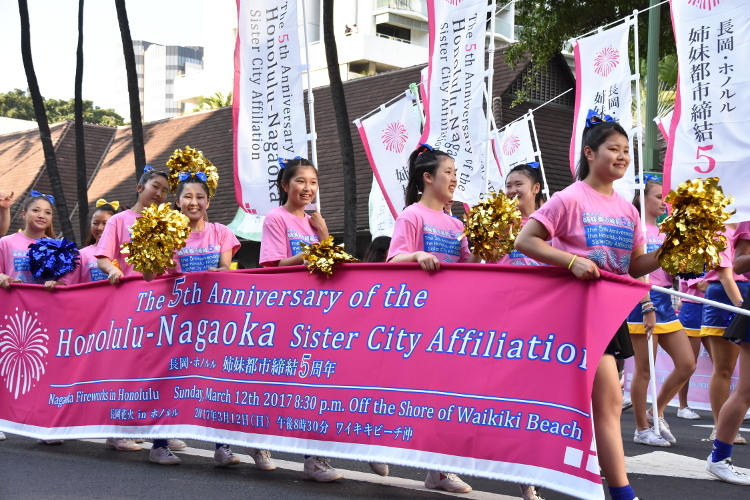 This year, Nagaoka City marks the 5th anniversary of sister city relationship with the city of Honolulu. 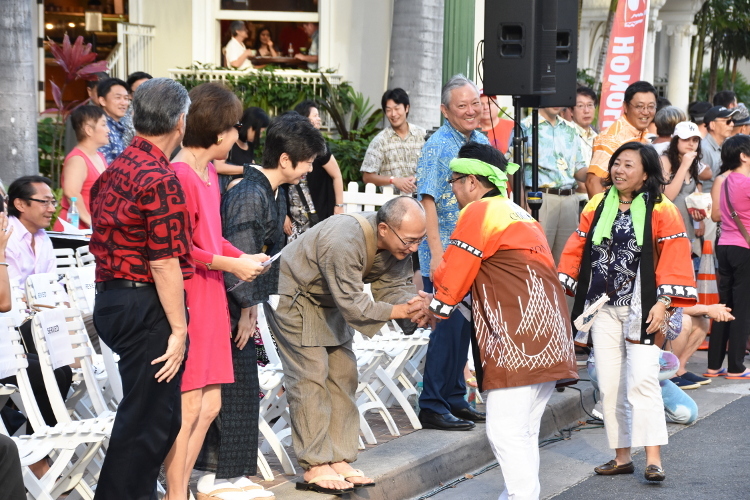 The Mayor of Chigasaki City came toward Yasushi Misawa, the Consul General of Japan in Honolulu and they had a firm handshake. 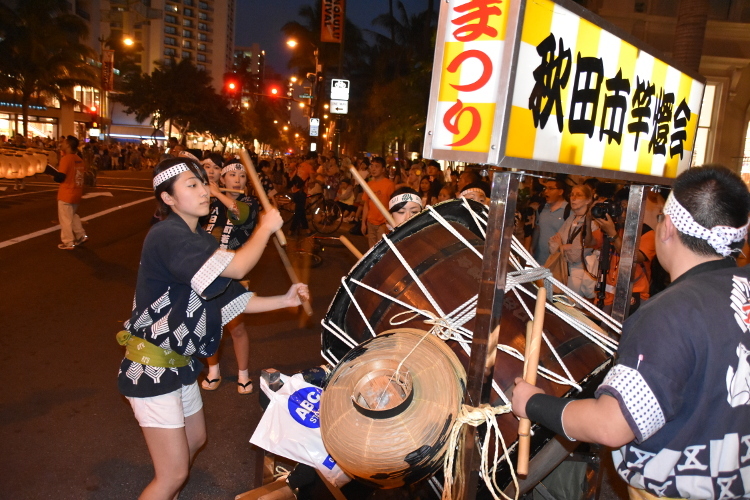 The powerful sound of taiko drums resonated on the streets. 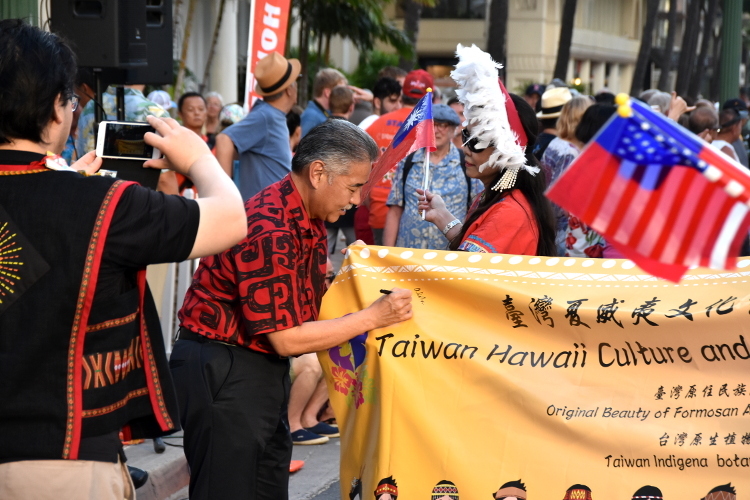 David Ige, the Governor of Hawaii wrote his signature on the banner of the Hawaii Chinese Center. 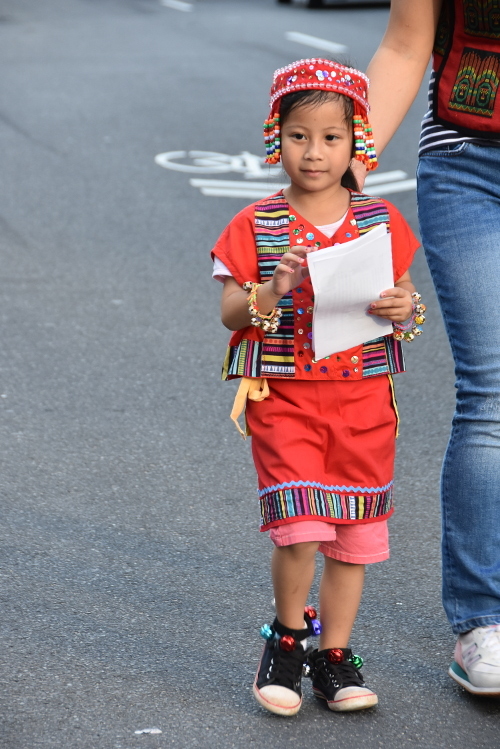 The children proudly marched on the streets as well. 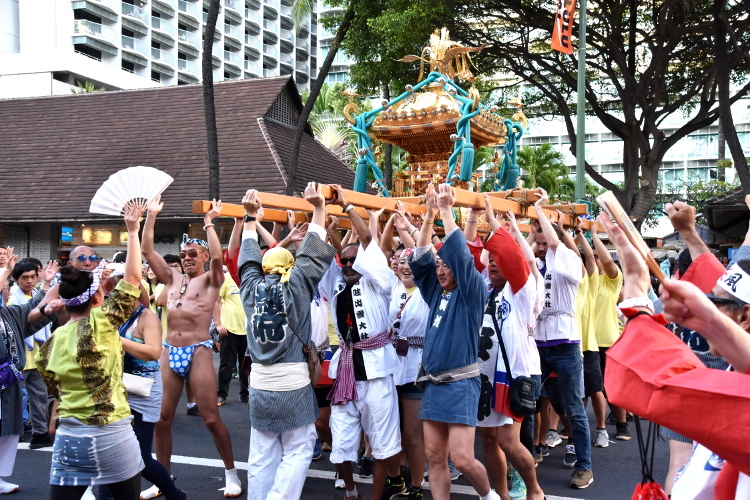 Izumo Taisha Mikoshi. 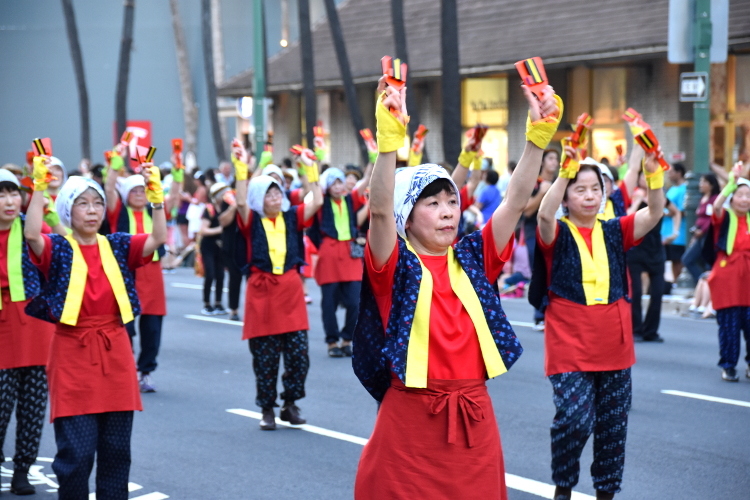 The performers were shouting “Wasshoi! 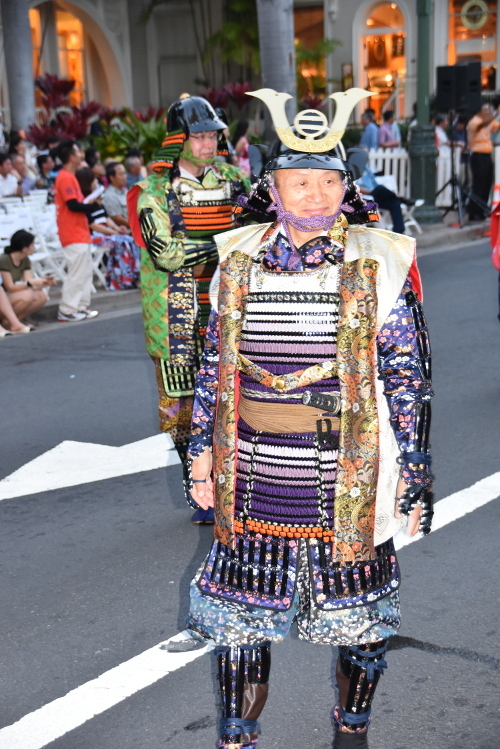 Wasshoi!” in front of the VIP seats. 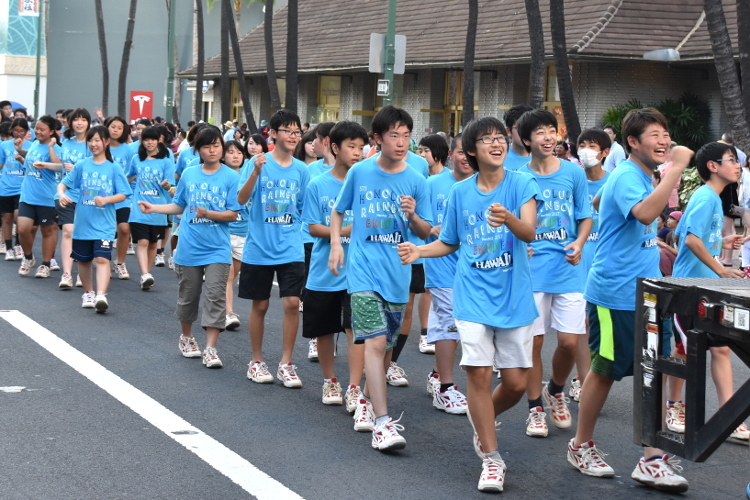 The students of Sakuragaoka Junior & Senior High School played active roles in the Educational School Tour. 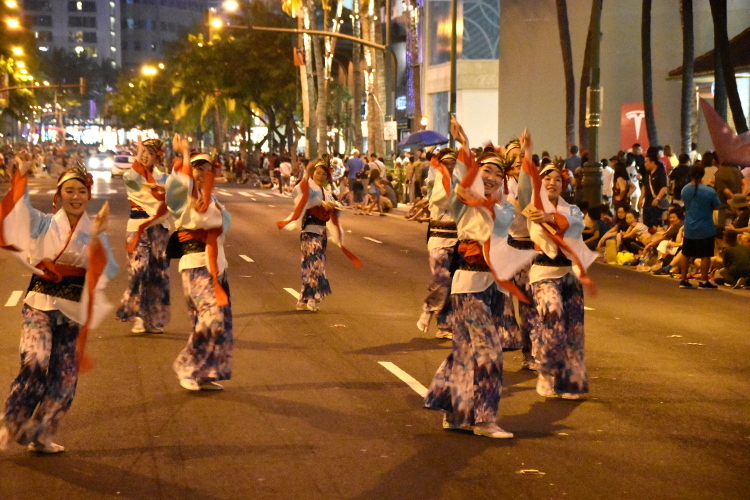 They performed their dance that they have been practicing for the parade as well. 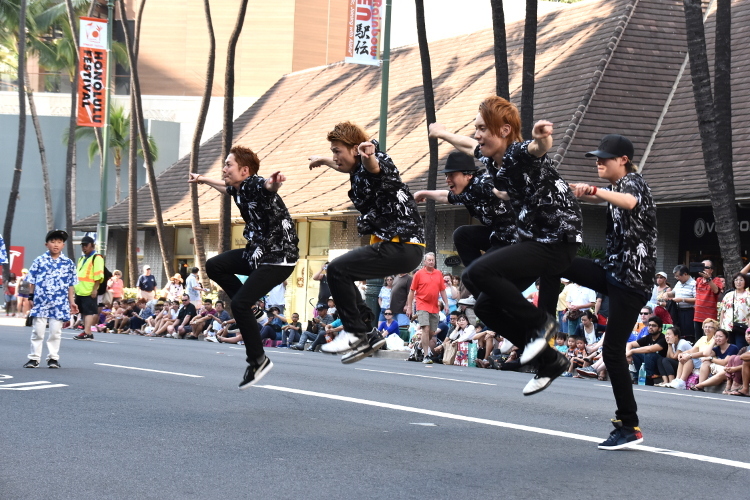 Ritsumeikan University dig up treasure performed Double Dutch, which the spectators gave applause to such an acrobatic performance. 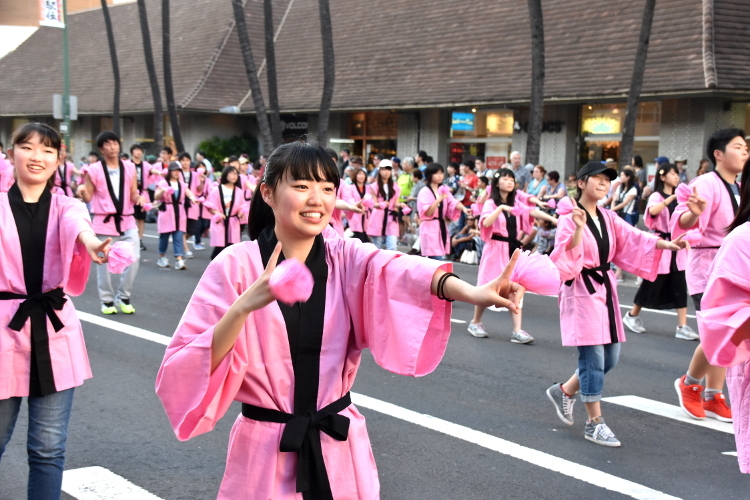 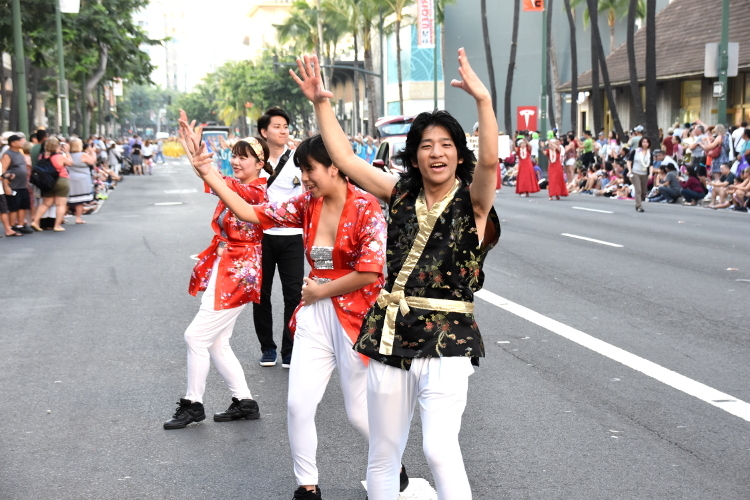 Kalakaua Avenue was filled with about 250 students of Sonoda Gakuen High School, where they danced vigorously. 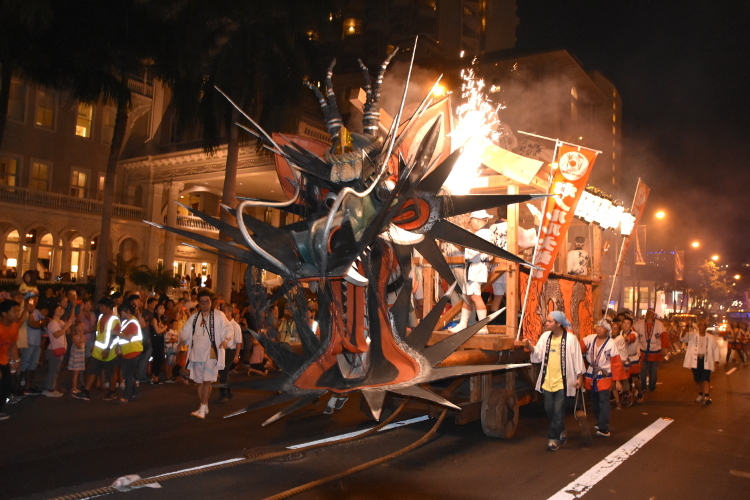 Saitama Rujin Matsuri Kai’s gigantic dragon rises in the sky of Honolulu with shining red eyes. 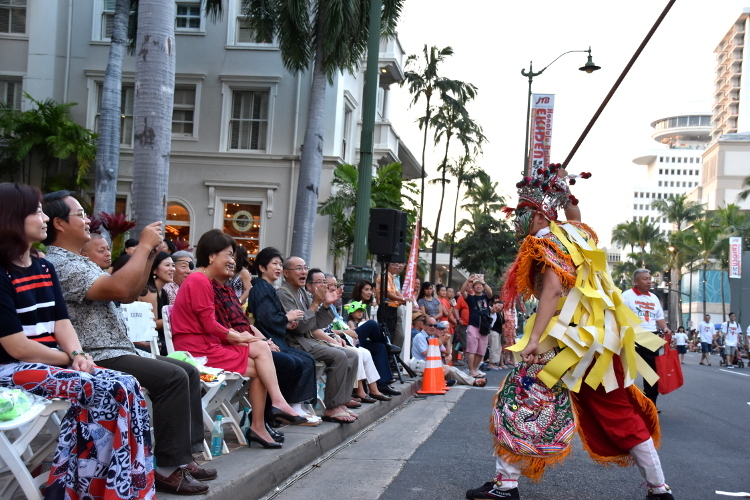 The members of BESTBODY INTERNATIONAL in Honolulu showed off their proud bodies to the crowd. 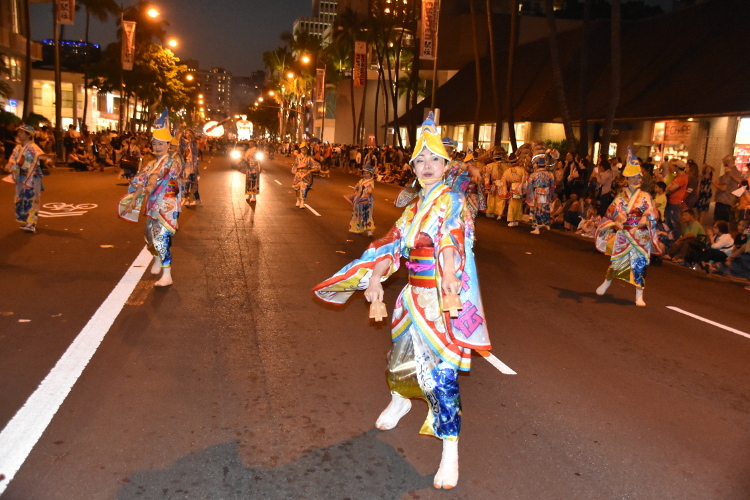 The Grand Parade reached its final stretch as the sky gradually became darker. 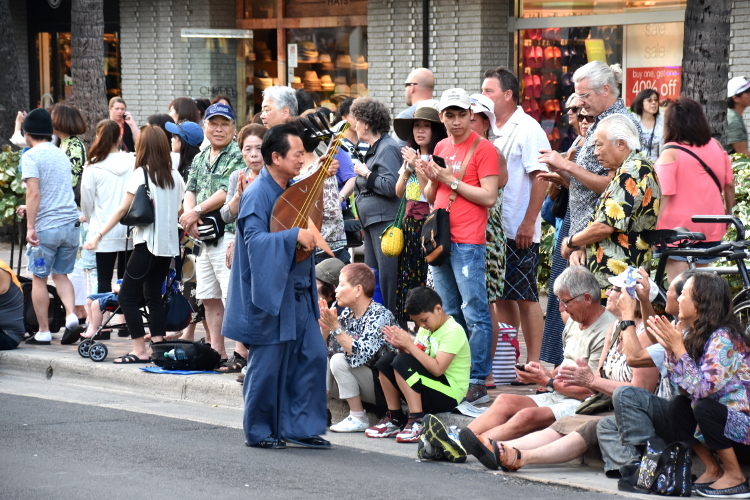 By the time when the sun was set, the Akita Kanto Festival reappeared and performed once again. 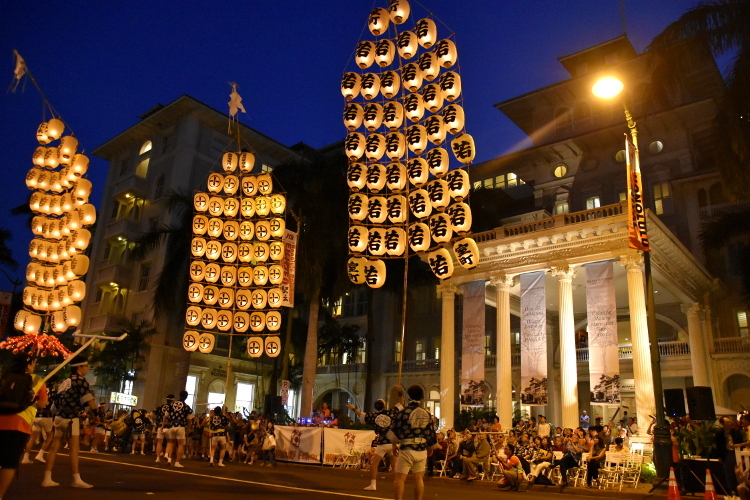 Those 46 lanterns are torched with real flame which lights up the darkness. 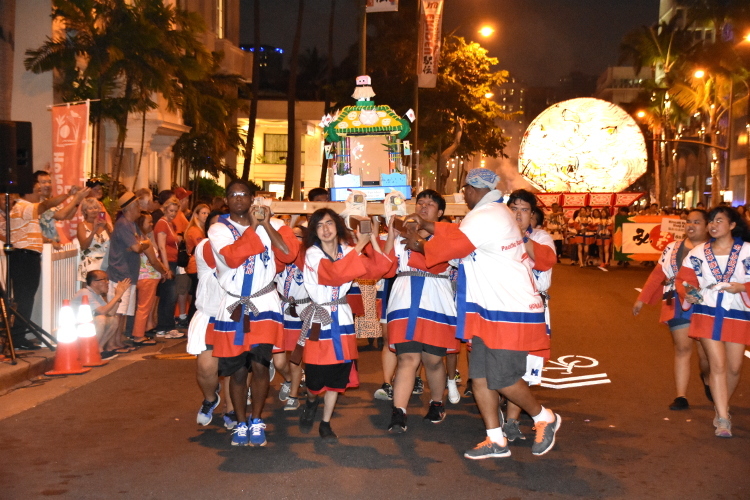 The words of encouragement were written on the lanterns. 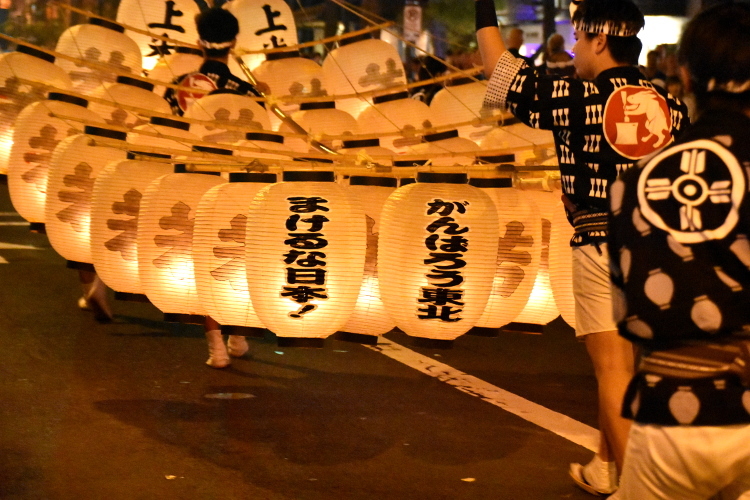 Those messages on the lanterns were conveyed by the spectators as well. 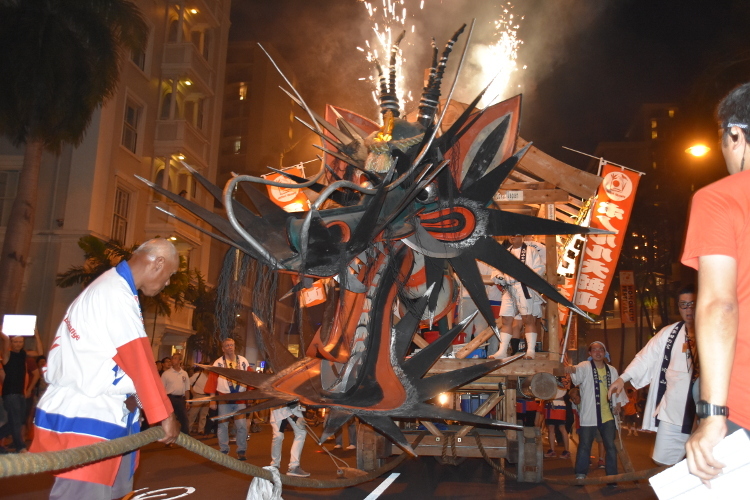 Then finally, the Honolulu Daijayama made a powerful appearance as the flames were sparking from its head! 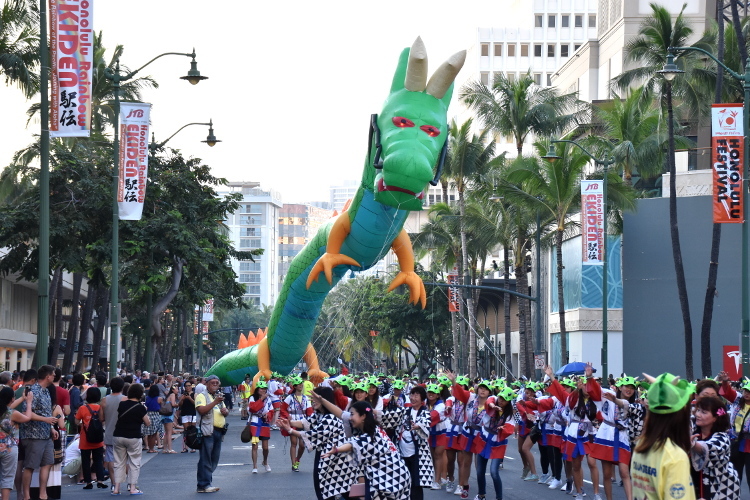 It appears for the finale of the Grand Parade every year. 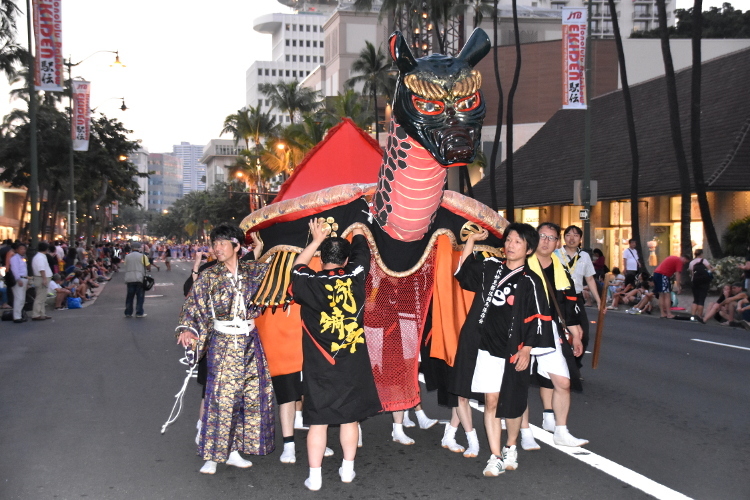 The Honolulu Daijayama stared at the spectators with a rough expression on its face as it moved left and right. 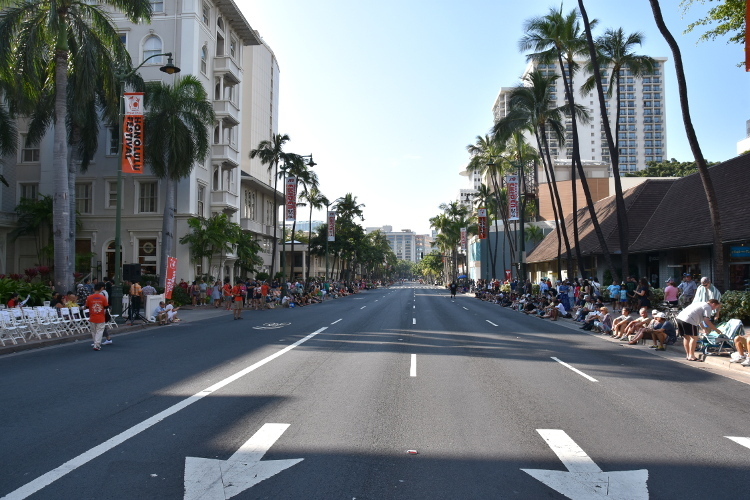 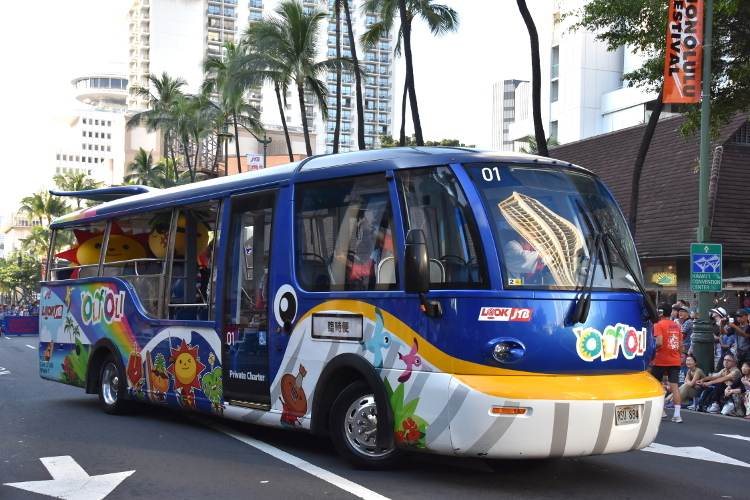 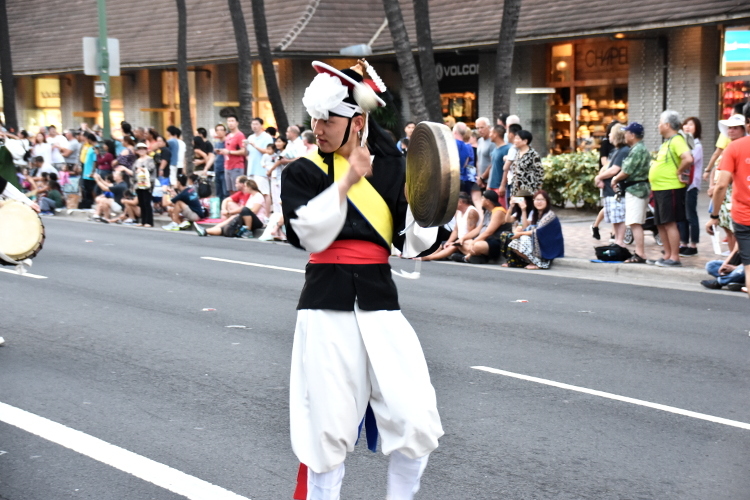 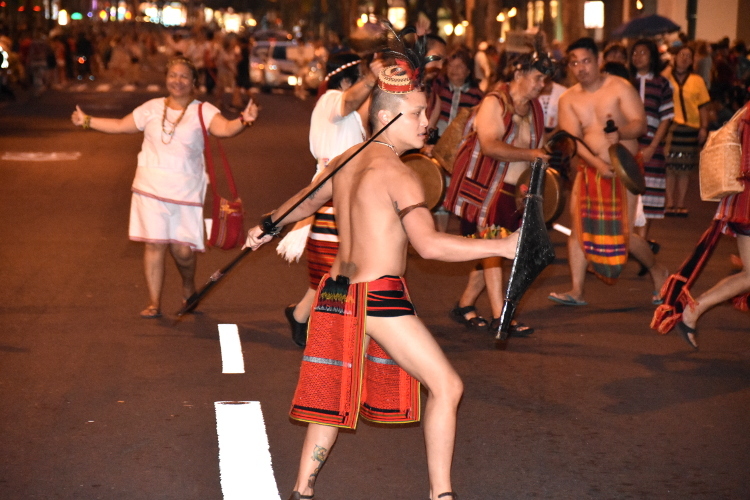 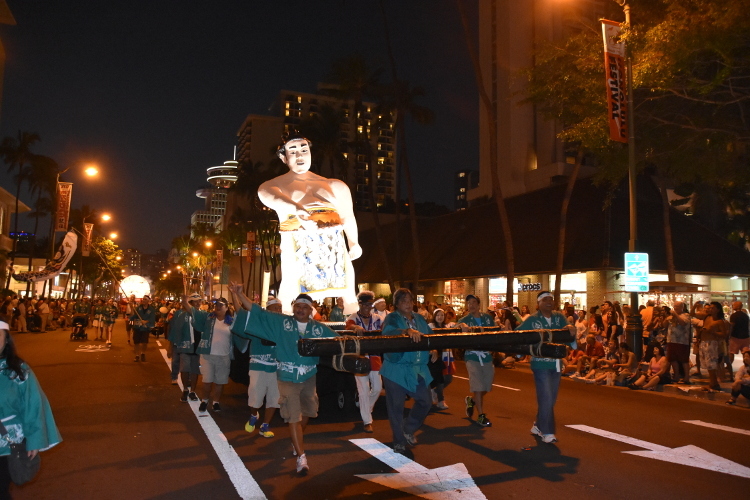 Kalakaua Avenue was still filled with excitement even after the final Honolulu Daijayama had passed by. 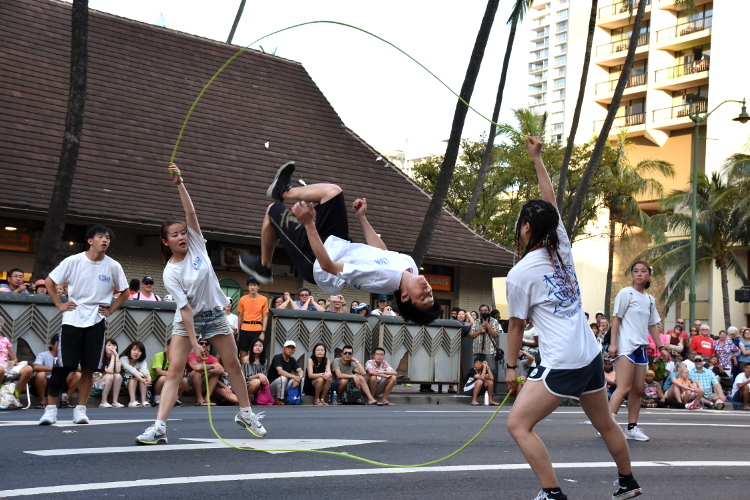 The performers performed their best with smiles while the spectators gave a big cheer. 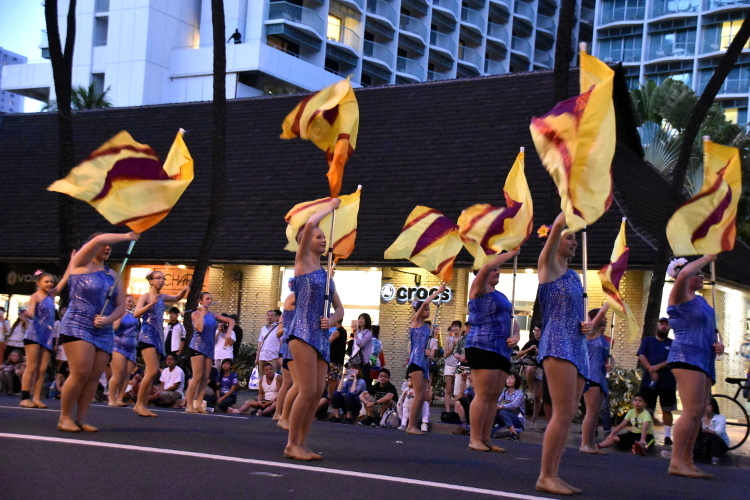 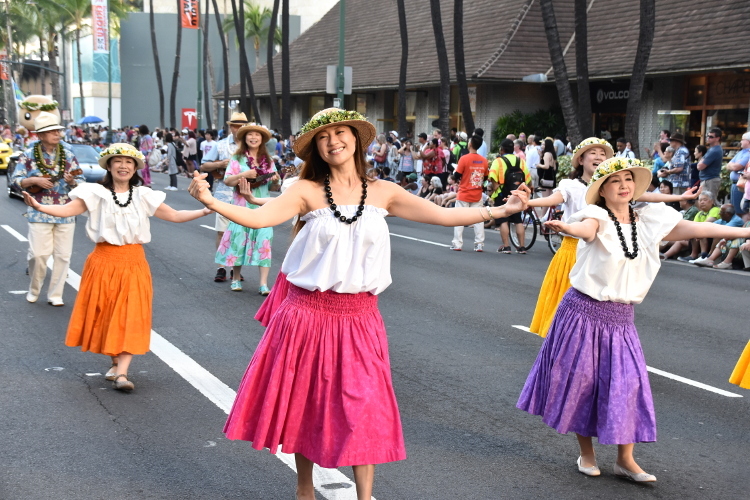 The Grand Parade was created by the performers, guests and affiliates from around the world with Hawaii, which this event can be a great memory. 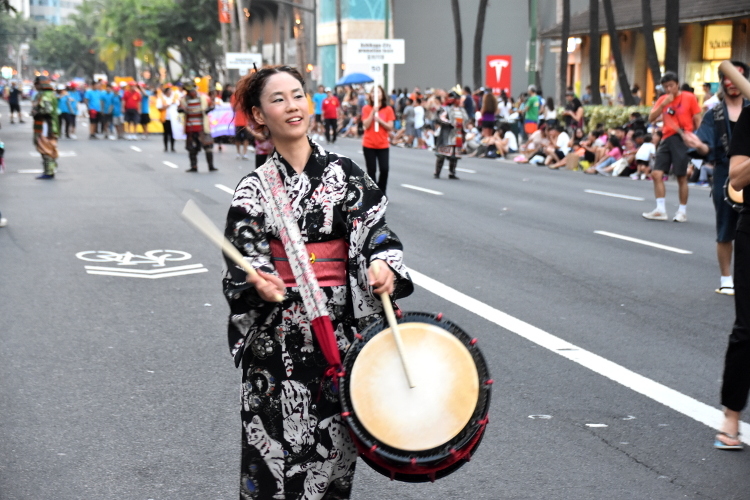 The theme of the 23rd Annual Honolulu Festival is “Cultural Harmony, Journey to Peace”. 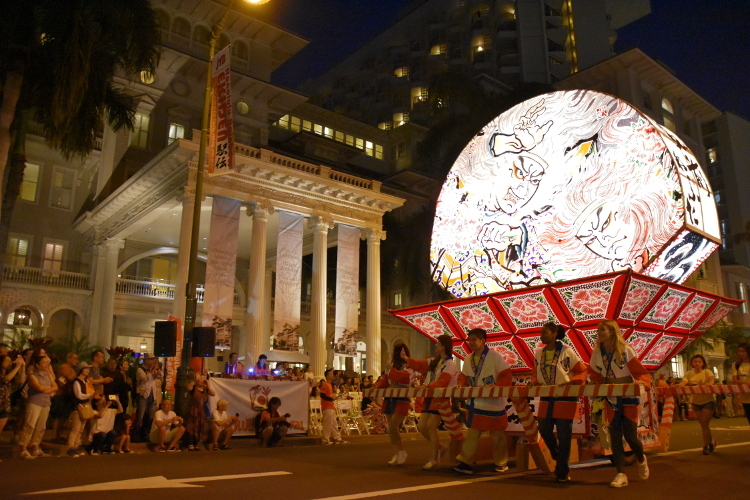 We believe that this Grand Parade leads to the “Journey to Peace”. 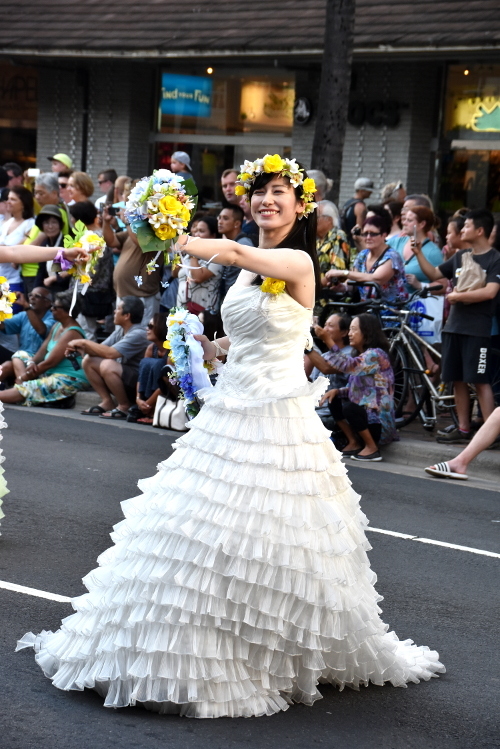 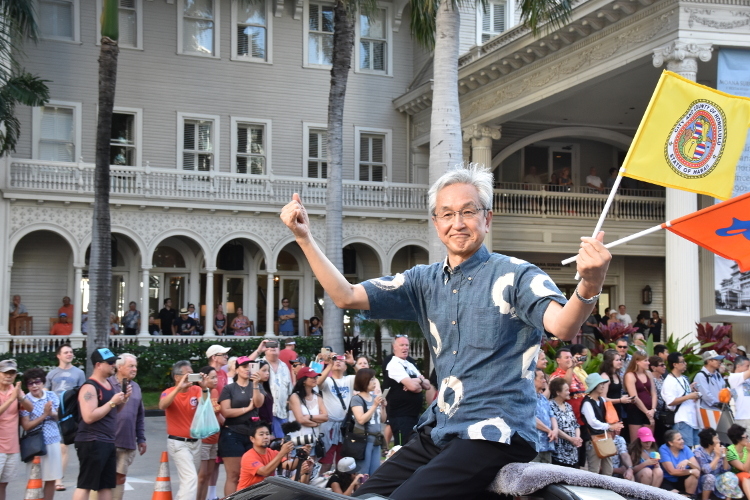 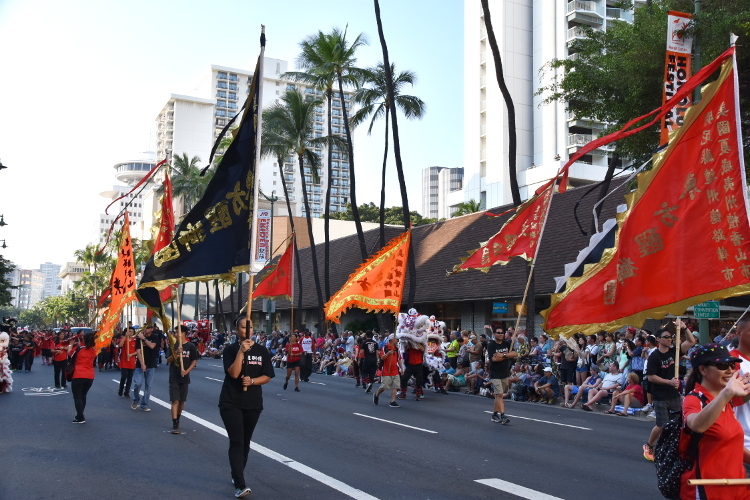 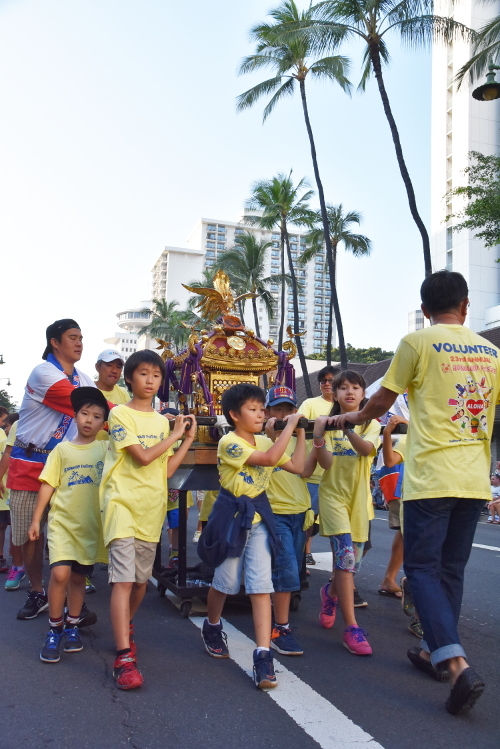 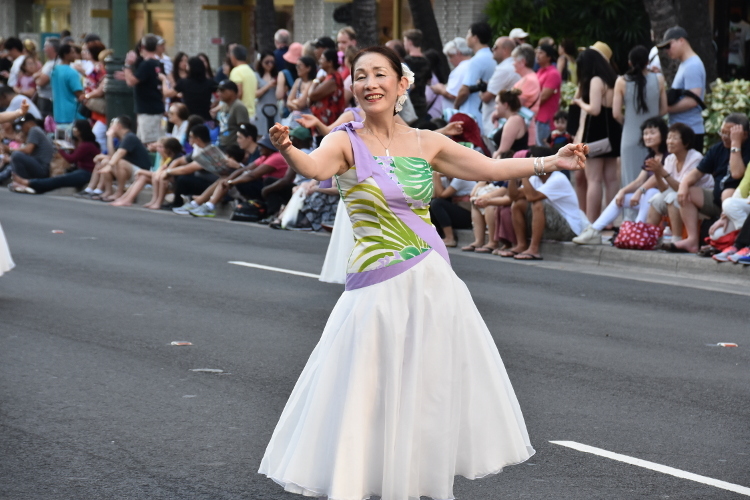 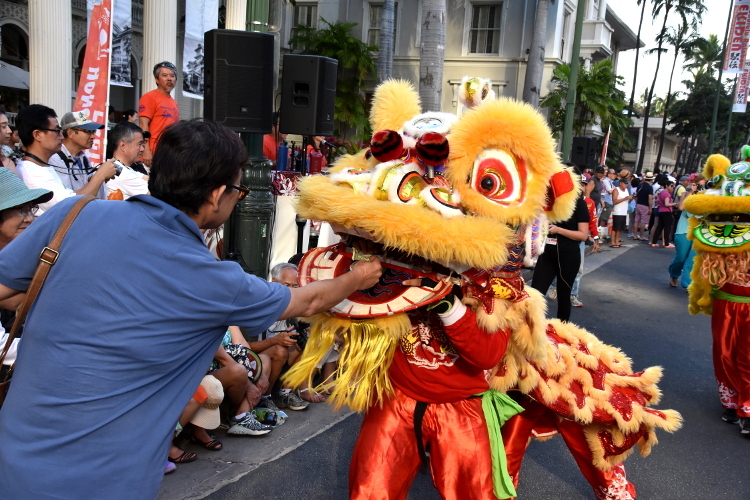 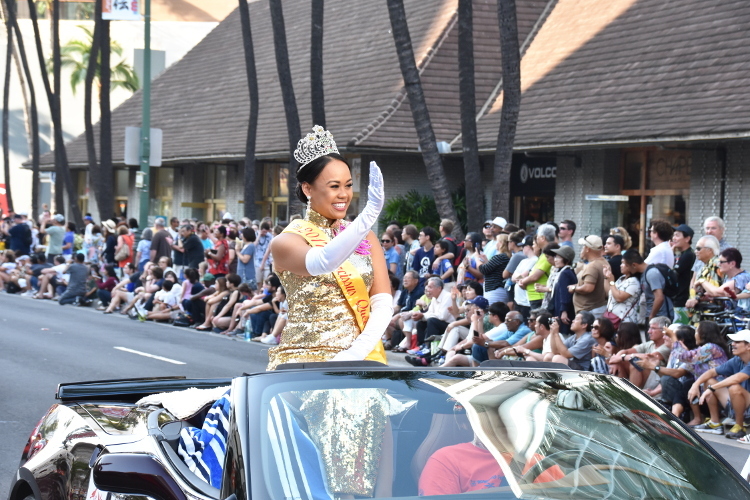 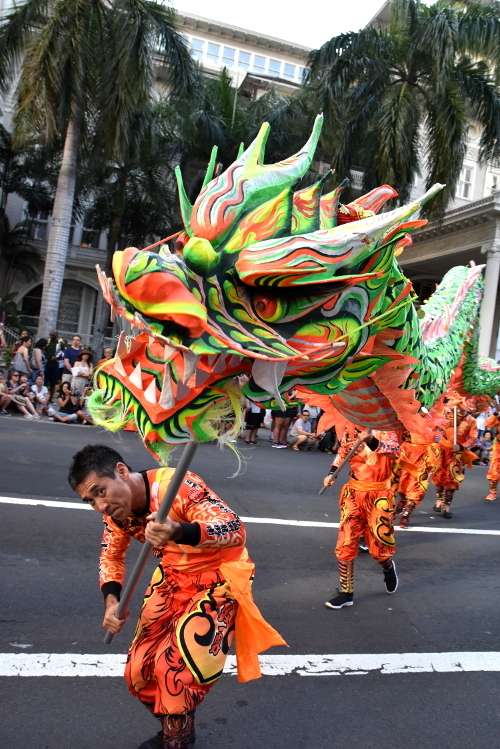 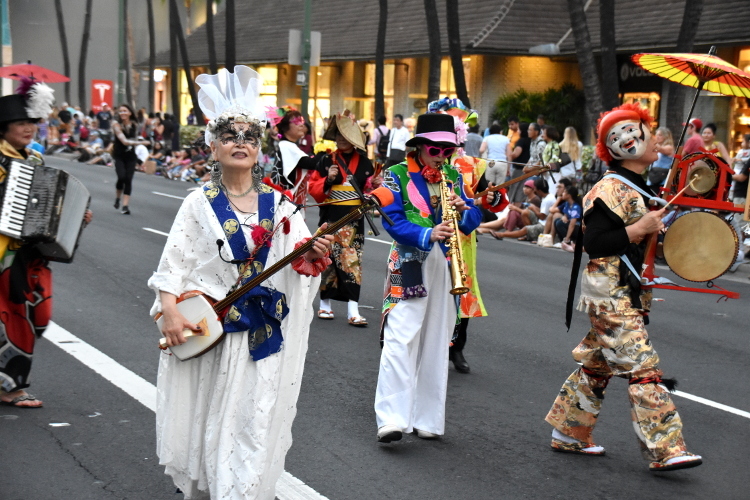 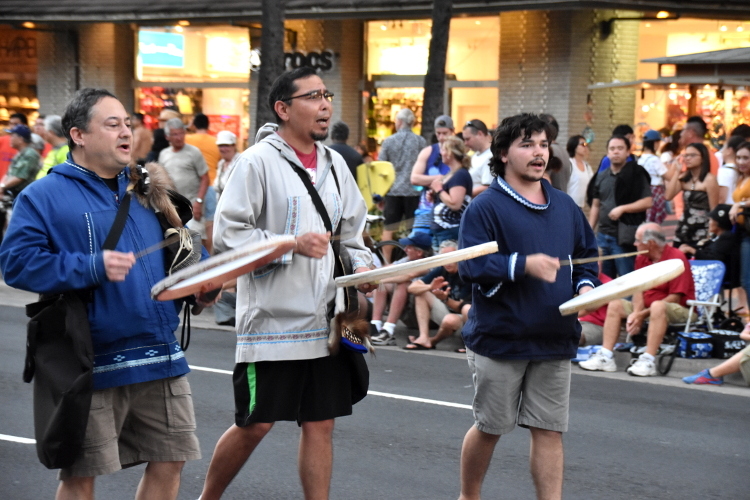 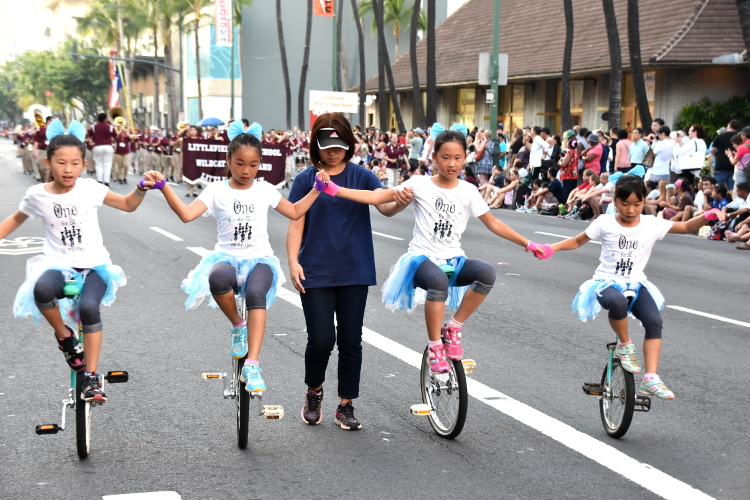 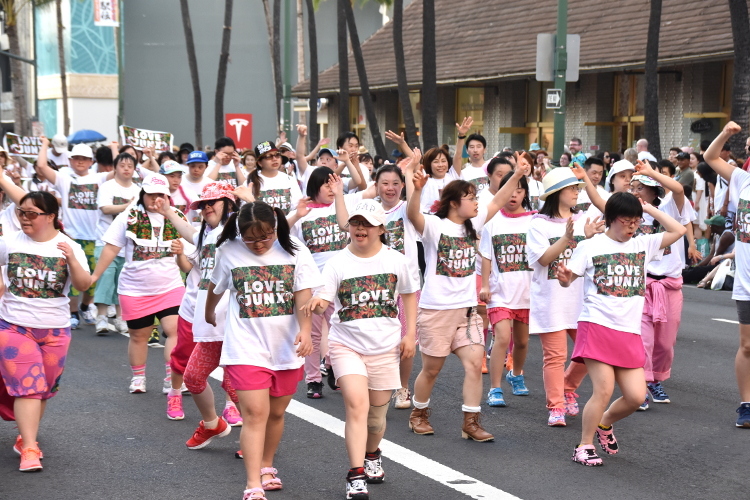 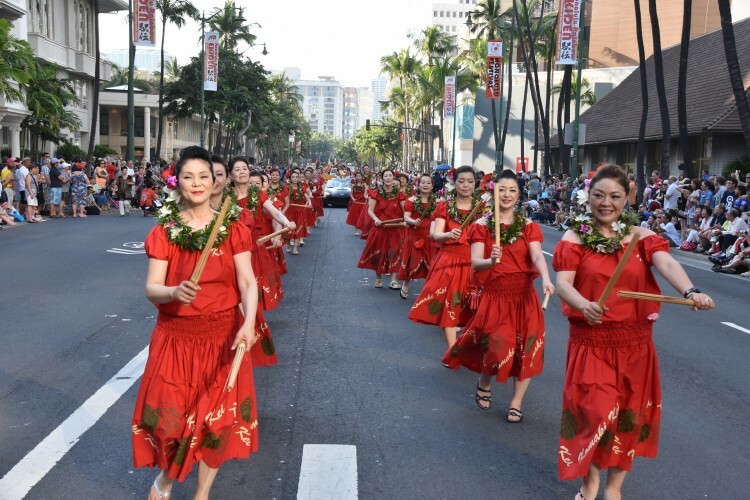 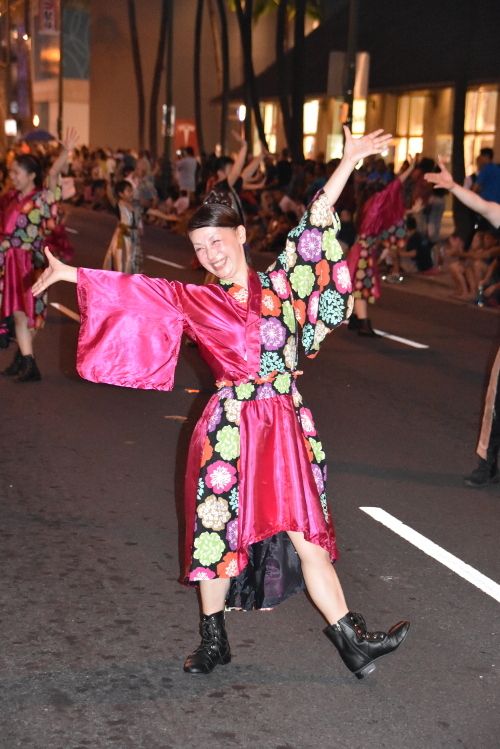 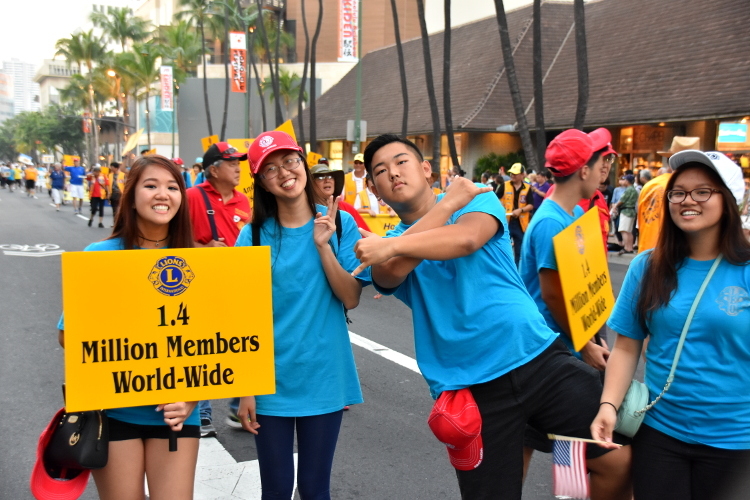 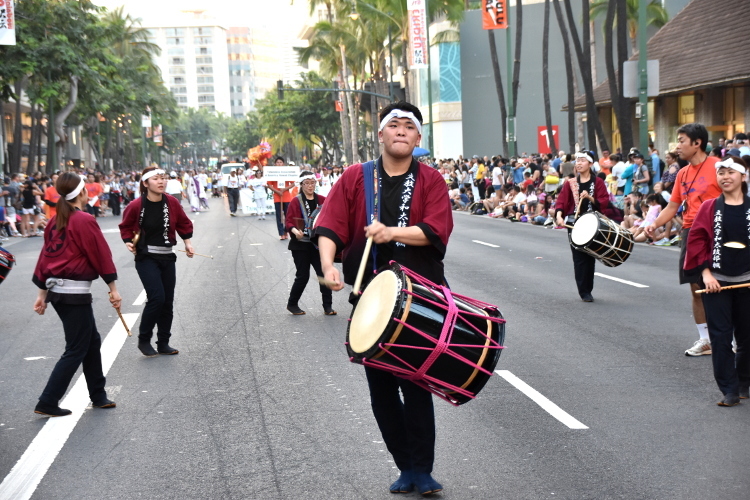 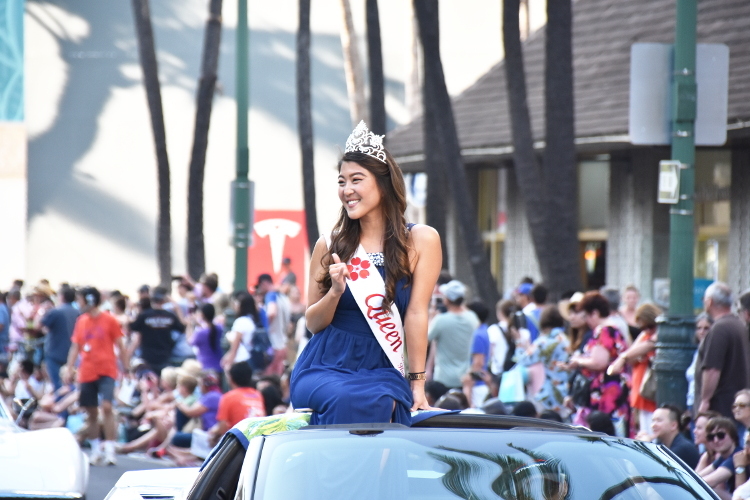 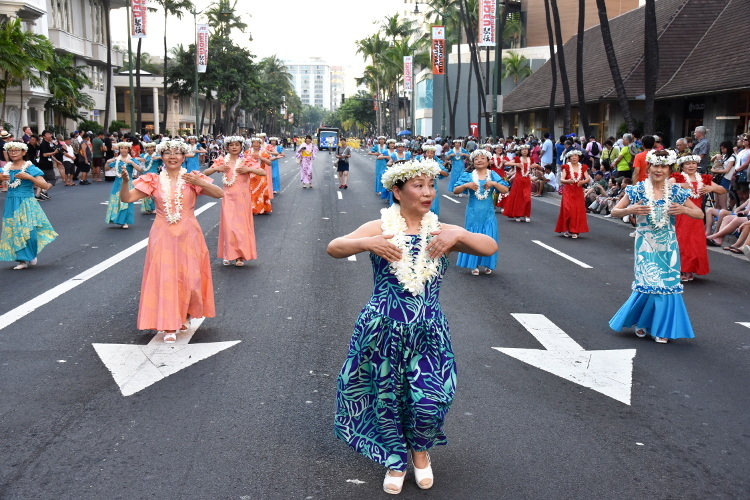 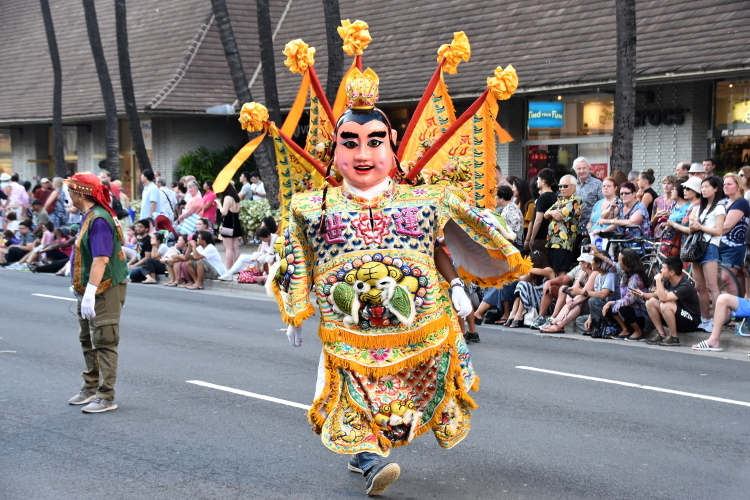 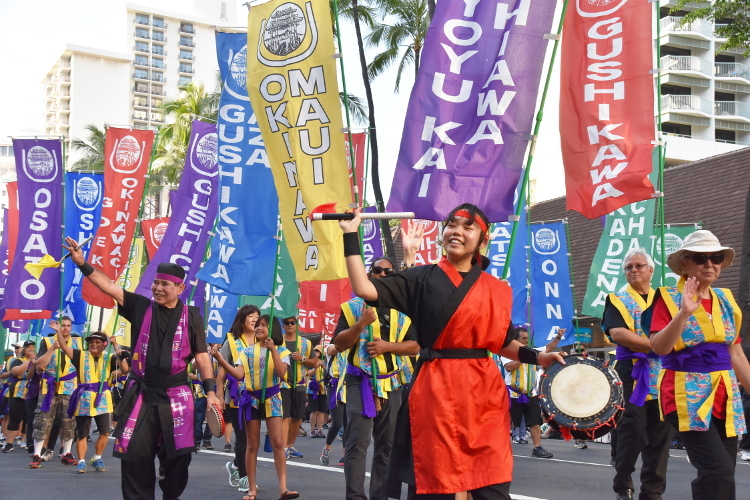 The Honolulu Festival will continue to host the Grand Parade every year, where people can enjoy cultural exchange and lead them to “Journey to Peace”.